Home › Tools › Is Grammarly Premium Worth It? Even if you don’t have the worlds best grammar skill, Grammarly Premium will make it seem like you do. As very few people are grammar experts. Grammarly is an online grammar checker that is available in a free version and a premium version. It will alert you to spelling, punctuation and many grammar errors and offer you the correct grammar correction. You can accept this correction or just ignore this correction. Giving you the final say on the matter. This is powered by an A.I. that uses context-specific algorithms to give you the best possible correction and finding all the mistakes. I love using Grammarly! It has helped me so much in writing and creating content for my websites. Even though initially I thought I didn’t need it. Big mistake on my part. As I corrected over 8,000 mistakes and errors on my websites after purchasing Grammarly Premium. My wife is an English Teacher, and I thought I could just have her correct my pages when she has time. English teachers don’t have time and having over 300 web pages to correct grammar mistakes is daunting for anyone. I buckled down and purchased Grammarly Premium and for two weeks went through every single page and post on my websites, fixing various grammar mistakes with Grammarly. Grammarly made this possible, cutting untold hours from proofreading. Mistakes I normally wouldn’t catch. Thereby, improving my reader’s experience which is always a good thing. I would first like to state that you can use Grammarly Free version, this version covers the most common critical spelling and grammar mistakes. This is one of the best free resources for fixing grammatical errors. 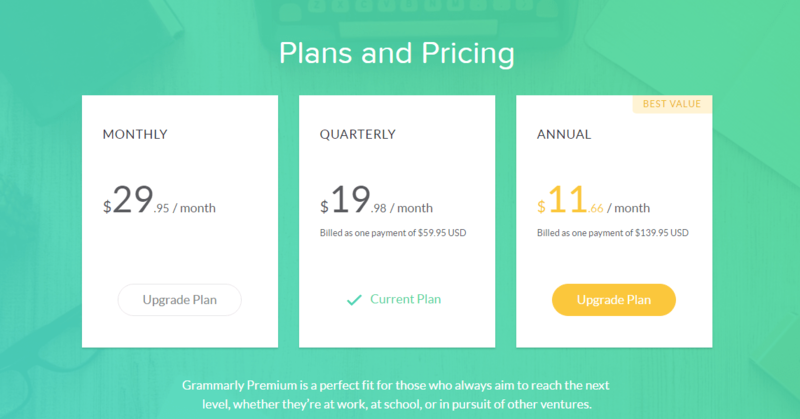 Grammarly Premium has three payment options, a month to month options $29.95 a month (the most expensive), a quarterly option $59.95 for three months (cheaper) and an annual option $139.95 a year (cheapest). So the month to month options breaks down to $25.95 a month to $359.40 a year. The quarterly breaks down to $239.76 for a year. While the annual plan breaks down to being just $139.95 a year. Terrific savings, to say the least. I personally went with the quarterly option, to give myself enough time to evaluate and work with the program, in order to determine if Grammarly provided what I needed. Needless to say, I went the annual after my three months were up. A real no-brainer for me personally, as I found it freed up more time for me and provided a much-needed service that proved invaluable to my websites in many ways. As with anything, I would say you sign up for a month and take Grammarly through the paces to help you determine if its worth the extra cost to you. If it is worth it to you, by all means, sign up for the annual membership, as this is the cheapest Grammarly pricing in the long run and will save you a lot of money. To get the lowest price, sign up for the annual service for substantial savings. With the purchase of the Premium plan, you will have over 400 grammar checks and complex writing errors checks. These will greatly improve your content and readers experiences. Grammar, punctuation, and spelling checks. Advanced checks for punctuation, grammar, context and sentence structure. Gives you alternate vocabulary suggestions. A plagiarism detector that checks billions of web pages. The most popular online grammar checker in the world. As there are over 10 million global users of Grammarly. Ease of use is great. I have never felt confused or frustrated using this program. Fast fixes to grammar mistakes. Faster than other online grammar checkers. Available on many browsers platforms Chrome, Safari, Firefox, and Edge. Also can be added to Microsoft Office (Word). Outperforms Microsoft Word for finding mistakes. Having correct grammar on your website helps with search engines rankings. Yes, they consider this important and rank you accordingly. Makes sure your readers can properly understand what you write. Anytime you can improve readers experience; it is a good thing. Will find common words that are overused in your text and give you alternate choices. Premium has four different English versions to choose from American English, British English, Australian English, and Candian English. Choose the one that best matches your specific English. Has a super fast synonym look up. Just double-click the word, and a list of synonyms will appear. Double-clicking will also show you a definition of the word as well. You will find that using this program regularly, that those common mistakes you often make when writing, that you will recognize and memorize those specific mistakes when writing and correct them immediately. Thus improving your writing skills, with or without this program. Keeps track of how many fixed mistakes you have made since purchasing this plan. This is slightly rewarding for me as I see it as a good return on my investment. They have a Grammarly Blog with many helpful tips and articles about writing, well worth a look-see. Can also upload documents, once you sign in to check for mistakes. The free version will constantly ask you to upgrade to Grammarly Premium. Can be annoying but see my Grammarly Tips below on getting a better deal. Must see! Some of the recommend grammar fixes are not always right and you must make the final decision on correcting the supposed error or ignoring it. But you can just evaluate for yourself, as you have the final say on the matter. If you are in no hurry to purchase Grammarly Premium but want the best possible price, I would recommend you install the free version and wait for an email from them. 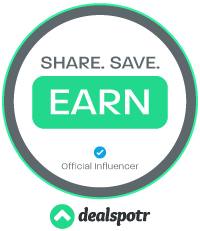 As they regularly send out discounts to your email for discounts on their Premium Plan. Patience will get you a better price. Not ever error detected is actually an error, and you must go through it and determine for yourself if an error is actually an error. This doesn’t take long to do and the time it takes is well worth the effort. Grammarly isn’t the only game in town, but it is one of the best. If you’re looking for alternatives, I will list some below. Anybody that does a lot of writing. Either through creating web pages, owning a website, having a job that requires writing, posting to social media, and editors. As using this grammar checker will provide a fast, effective tool for catching mistakes. Grammarly has a general Handbook and a Grammarly EDU to get you using its program right away or if you are having a hard time grasping the program. I have found the program pretty intuitive to use it. They have a well of knowledge at their support center full of general questions and problems. This is a really stacked support center and can be located under the Support tab at the bottom of the screen. They also have a Contact Us for direct support. This is a must have!!! I personally put off purchasing this product and really regret it, both for my readers and myself. As I have had many complaints about my writing mistakes. Well not anymore! After I purchased Grammarly Premium, it has put an end to this. You need this program especially if you loath proof-reading. It will take your writing up a bunch of notches. If you are on the fence about paying for the premium, you should at least give the free edition a try and then base your decision on using the free version, even though it doesn’t have all the bells and whistles as the premium edition. Would love to hear about your experiences with grammar, Grammarly or any other alternative grammar checker. What do you use?